Cupcakes would be our evening tiffin in our hostel. I remember eating them in my boarding school and also in college hostel. Only one cupcake will be served, and it would never be sufficient for us. till the dinner is ready, we had to starve or some times we head to canteen, to have Noodles or fried rice. I usually have a partner to share one plate of Veg fried rice / Noodles. chatting and eating with her would be a great time. Iam really glad, that me and my partner are food bloggers now. we would also go to movies on thursdays, as we both used to have free periods on thursday. and more than that, one thing bonded us was, we hailed from the same native place. I was thinking all this while baking these cupcakes. You all might know, that i was not actively blogging, for the past two months. Sharmilee of Sharmi's passions gave me a Good Push, to blog frequently. I hope, i will maintain this pace in the coming weeks too. as her first event, she is hosting, is getting over by today, i wanted to submit my entry too to her. As i sleep along with my son, in the afternoon, i miss catching up with blogs or baking. but today, in my half-way through the sleep, i woke and went and baked these cupcakes, to send her this sweet little entry. 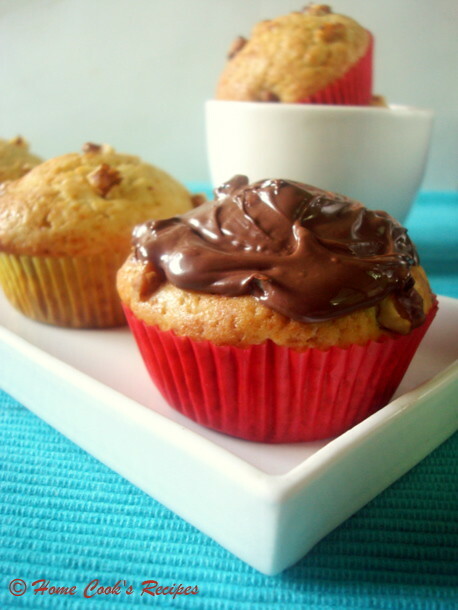 Here, Walnut Cupcakes are for you Sharmilee. Pre-Heat the Oven at 190C for 10 minutes. Line the Muffin Pans or grease the muffin pans with little butter, if you dont have muffin lining papers. Sift the Flour, Baking Powder and Baking Soda atleast three times. In a Mixing Bowl, Have the butter at room temperature. add powdered sugar and beat well either with a hand whisk or hand blender. After Creaming the Butter with Sugar, Break egg's into them one by one and beat well. Add Vanilla essence to the bowl and beat well. Now add sifted flours little by little and mix with a wooden spoon. add little milk and give a mix with the wooden spoon. Add chopped walnuts and give a soft mix. and drop a spoon full of mix onto the lined muffin pans. Bake the Cupcakes for 15-18 minutes at 190C. or till a toothpick inserted into the centre of the cupcake comes out clean. After Baking, cool the cupcakes for atleast 10 minutes. I frosted the cupcake with Nutella. It was yummy, though the frosting patterns was difficult for me. The Cupcakes was great in taste. the sweetness was just correct. If you are planning for frosting, go ahead with the same sugar amount mentioned in the recipe. if not using frosting, increase the sugar amount by 1/4 cup. 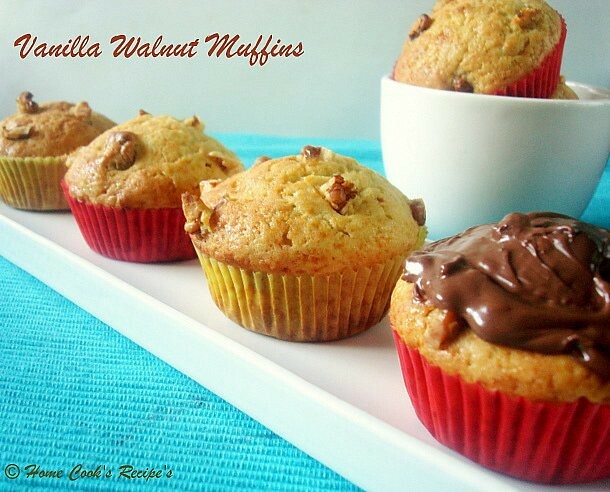 Vanilla Walnut Cupcakes are heading on the last train to Sharmi's Let's Munch - Light Tea Time Snacks. Vathakuzhambu is certainly not my choice. but my hubby loves it very much, that too, if it has coconut milk, its heavenly for him. after Varalakshmi viratham, i usually have more coconuts, which had to be used fast. so this vathakuzhambu with coconut milk, was prepared for yesterdays lunch to use up the excess coconuts laying on my fridge. it turned out so Good. i never like vathakuzhambu, but this kuzhambu with coconut milk was so tasty and i liked it too. Heat a Kadaai, and add 1/3 cup Gingelly oil and heat it, add Sundakka Vathal and fry them in medium flame. Remove the fried sundakka vathals and keep aside. Add mustard to the oil and let it splutter, add curry leaves, asafoetida powder, garlic and shallots and fry them well. After frying the shallots, add chopped tomatoes and fry along. 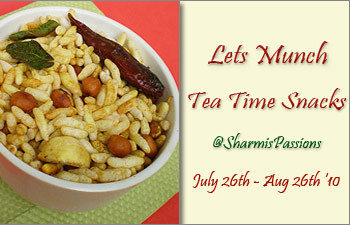 Add 2 tsp's of Sambhar Powder, 1 tsp of Dhania Powder, 1/4 tsp of Turmeric Powder to a Cup of water aand mix well. add this mixed water to the kadaai and let it boil for 3-4 minutes. Add Sundakka Vathals to the kadaai and add very little salt. Now switch off the flame and add 1 cup of coconut milk to the kadaai, mix well. do not boil after adding coconut milk, as it may curdle. 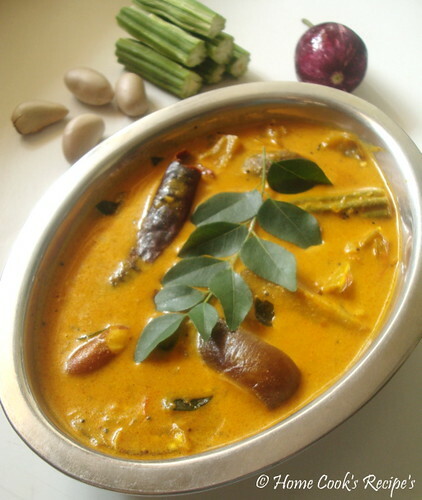 Serve this Vathakuzhambu with Hot Rice and Appalams. I am a brownie addict. whenever i buy dark chocolate bars, i turn them into delicious Brownies. 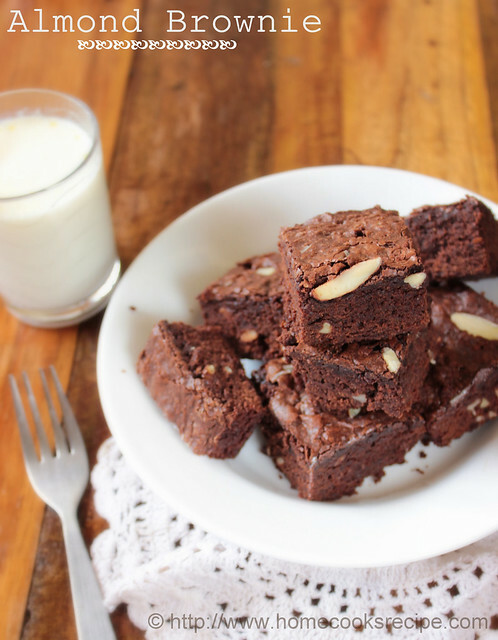 Last week, it was a brownie week for me, as i tried two variety of brownies, one was low fat banana brownie and the other is this almond brownie. banana brownie, varied from the usual ones, for me, it tasted much like banana-chocolate halwa!! But this almond brownie came out so perfect. I could proudly say, this is one of my best from my baking experiments. now this brownie is attending Brownie event at divya's place. This is such an easy method, coming to the recipe. Pre-Heat your Oven at 180c / 330F. for 10 minutes. Line a Baking Bowll with a aluminium foil sheet or butter paper. Get ready with your Double boiler or Heat 3 cups of water in a bowl, let the water boil. Simmer the flame. Place another fitting bowl, with Dark Chocolate and Butter over the bowl of hot water. Let the Chocolate and Butter Melt together and turn into a chocolate sauce like one. Switch off the flame and remove the bowl. Break an egg to the chocolate - butter sauce and mix well. break another egg and mix well. Mix all the Dry Ingredients together and sift them twice. Now add the mixed Dry Ingredients in 3 batches to the chocolate-Butter-Egg Mix and mix with a wooden spoon. add little milk, if the consistency of the batter is too thick. Add Greated Almonds and give a mix. Pour the mixed batter to the lined baking bowl. Top them with some grated Almonds. Bake at 180c for about 40 - 45 mins. till a toothpick inserted in between the centre and the corner of the bowl comes out clean. Remove the Baking bowl and dont disturb it for 10 minutes. After 10 mins. Remove the Brownies along with the foil sheet and cool them on a board or wrack. Allow the Bownies to cool for 45 minutes to 1 hr. 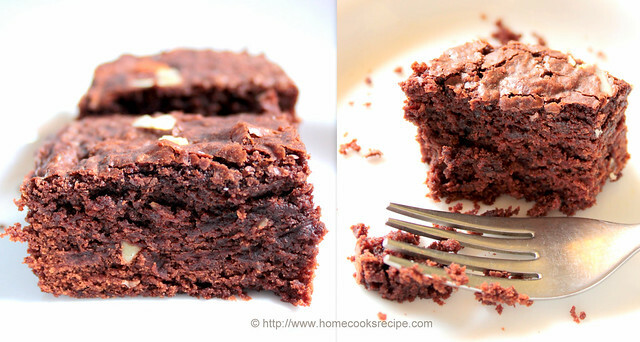 Cut the Brownies into squares or bars and store them. What I learned from this attempt? - Need not cream the butter and sugar. and also need not beat eggs into the mix. all these yields a crumble brownies. 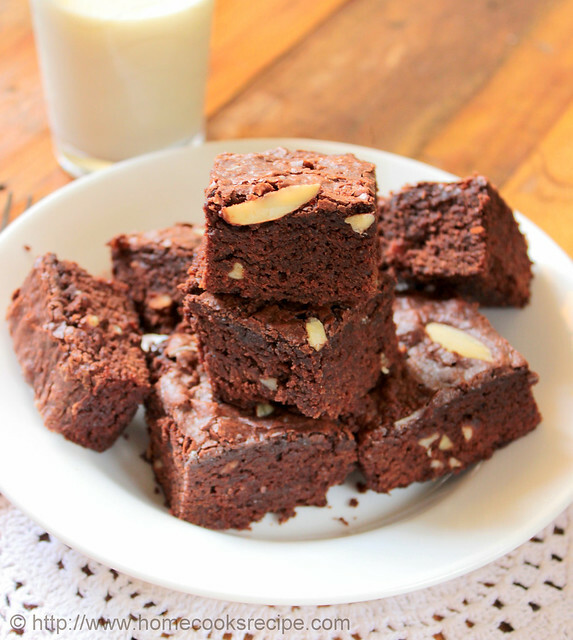 - Allow the Brownie to cool down completely with patience, and then cut them into squares. -Never over bake the brownies. Thanks Raji for pushing me to try these Great Brownies. I was not regular here, as me and my son fell ill one after another. It was Very Difficult Part of life, to take care of my son, dropping and picking up trips to school all alone, when i was ill. I would not have suffered this much, if my husband was here. Thank God, time passed very fast, and my hubby will be with us in 3 hrs. i just dont want to sleep, till i receive him. so you know, why iam relaxing here. 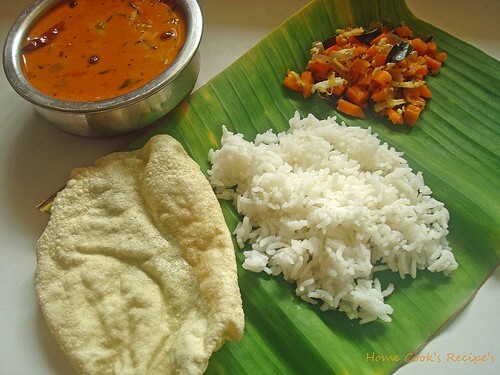 Also one more reason, why i did'nt frequent here is, i did not cook much other than idli's for break-fast, and Rasam with some Poriyal / Vegetable for Lunch and Chapathi's or Dosa's for Dinner. But now i assure you, you will see me back in Power, as iam longing to cook lots and lots for my hubby, who cooked and ate all alone for the past 3 months. Let me Come to today's recipe. We call this Curry as Oorppu. 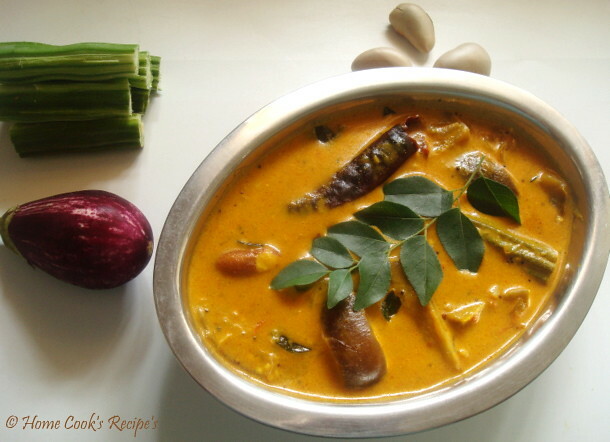 this is basic kuzhambu recipe, but has milk in it. i think this curry may be called different in other housholds. 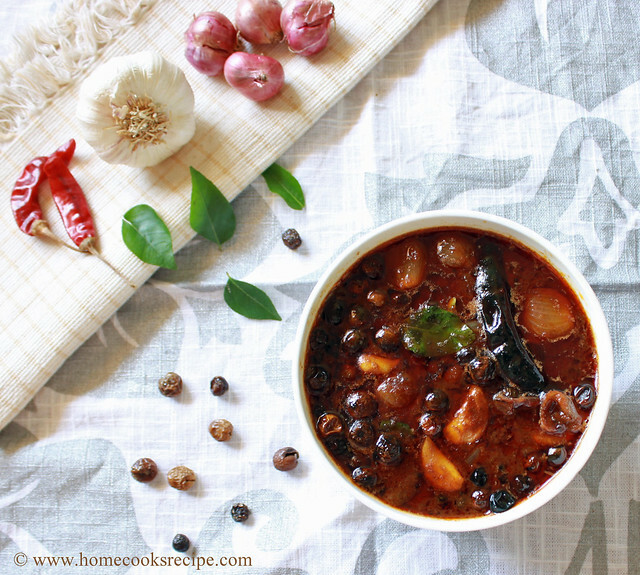 This curry is always prepared with these specific vegetables - Murungakaai, Palakottai and Kathrikaai. Potato would also make a nice combo. 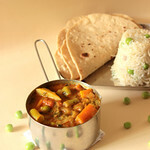 So if you want to try this curry, stick with same vegetables for good taste. This is one of Grandmom's special. my mom also prepares it equally good. Heat 2 tbsp's of oil in an iron skillet, add mustard and let it splutter. add fenugreek seeds, dry red chilli's and curry leaves. roast them all for 1/2 a minute. Pressure Cook the Jackfruit seeds and Drumstick for upto 5 whistles. remove the outer skin of the Jackfruit seed and keep aside. chop the Brinjals into pieces and set aside. Add finely chopped Onion and fry them till they turn translucent. add finely chopped tomatoes and fry along with the onions. add little bit of salt, to speed the frying process. add turmeric powder and chilly powder and mix along with the onions. Add the Brinjal pieces to the Skillet and mix them with the masala's. let the brinjal get shrinked for a minute and add Jackfruit seeds and Drumsticks. also add salt to taste and a cup of water. Close the Skillet with a lid and reduce the flame to low and let brinjals get cooked for 5 minutes atleast. Once the Brinjals are Cooked, remove the skillet from flame. Now add the Boiled and cooled milk to the skillet and give a mix and transfer to a serving bowl. Serve it Hot with Steaming Hot Rice. 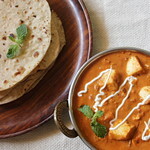 * The Milk reduces the Spicyness of the Curry and gives a nice taste. 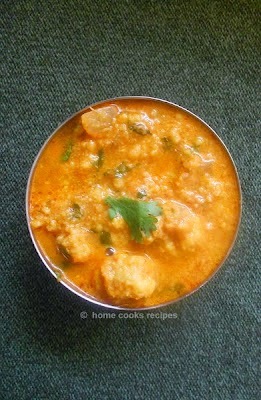 * If you have excess milk, go for this curry. * Also Stick to Vegetables Drumstick and Brinjal.